You sit on the street corners waiting to feed the masses of hungry people that are about to arrive. They’re ready to stand – hungry (sometimes in the rain and a long line) for their turn to get one of your niche foods. Food trucks are all the rage right now in large cities and small towns. As a chef on wheels, you take your craft and turn out delicious delicacies, often moving locations from day to day. 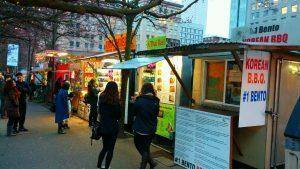 While a food truck may not be a traditional restaurant, there are still local, state and federal standards to abide, as well as insurance to purchase. If you are thinking of branching out into the food truck marketplace, we breakdown the food truck insurance you might need in Arizona. You’ve sacrificed a lot to create and invest so much into your food truck business. Let the insurance professionals at Insurance Brokers of Arizona protect it with an insurance policy just for food trucks! Coverage varies so it is best to speak to a knowledgeable insurance agent about your options. Call Insurance Brokers of Arizona at: 480-812-1998 or, request a quote online for food truck insurance in Arizona.